There’s a utilitarian charm about Jaik Faulk’s still-life oil paintings that’s as puzzling as it is satisfying. Is it old-hat to paint pictures of flowers and vanitas scenes; or rather, are those just the visual diversions we need? Walking into Faulk’s November 17th opening at Nationale, just days after election night, I was relieved not to be force-fed images of a certain orange demagogue or other equally horrifying contemporary scene. 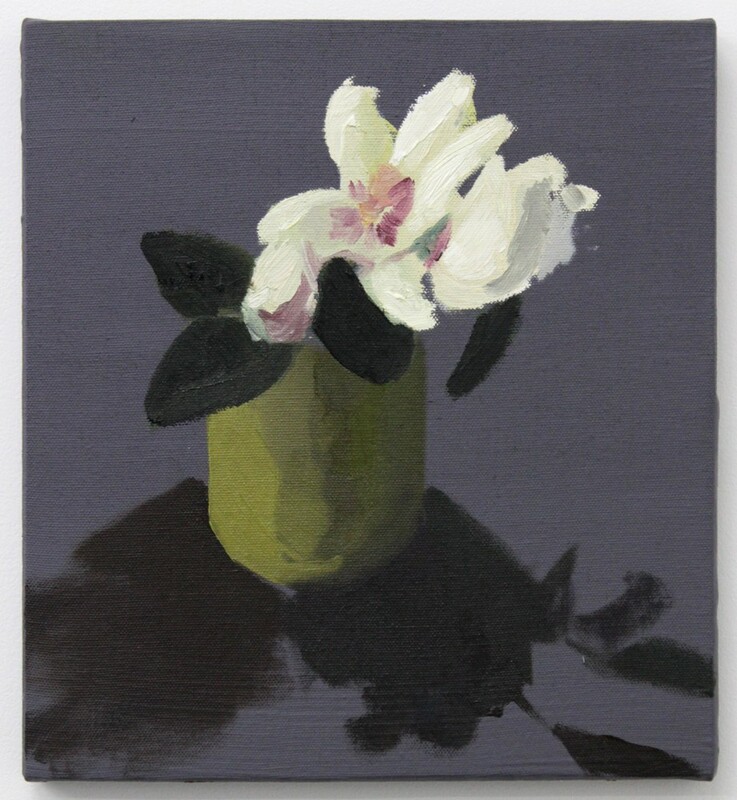 The show title, I feel alright with azaleas around, pretty aptly describes what’s radical about this group of paintings. When American life seems every bit of the spectacle we’ve been warned about, nothing in Faulk’s paintings bear mark of daily news, or even current art trends for that matter. Nothing’s being sold here (besides, well, the paintings themselves). No dogmatic idea anyway, and this is part of what makes the show a breath of fresh air. The paintings look like they could’ve been made during any era, and yet there’s pretty much no trace of what’s distinctly our epoch. But there are reasons to look closer, to think about the paintings as someone being entertained. Faulk’s nine I feel alright paintings are provisionally traditional; I think he did this on purpose. They belie a lack of story (for lack of “life”) but in that, they illustrate things that animate the psyche. What Faulk depicts are deathlike: masks, skulls, bottles, wigs, and false magnolias that he made by hand just to paint. There’s no arbitrariness in these things, ontologically, and in the Anthropocene there are implications for every made and natural thing. By Faulk’s having painted them, their distorted compositions are open for different readings — a bit like an imagist’s poem. But these non-objective, pleasantly bleak paintings show a psychic experience rather than dumb perceptual observation that begs no question, requires no feeling. 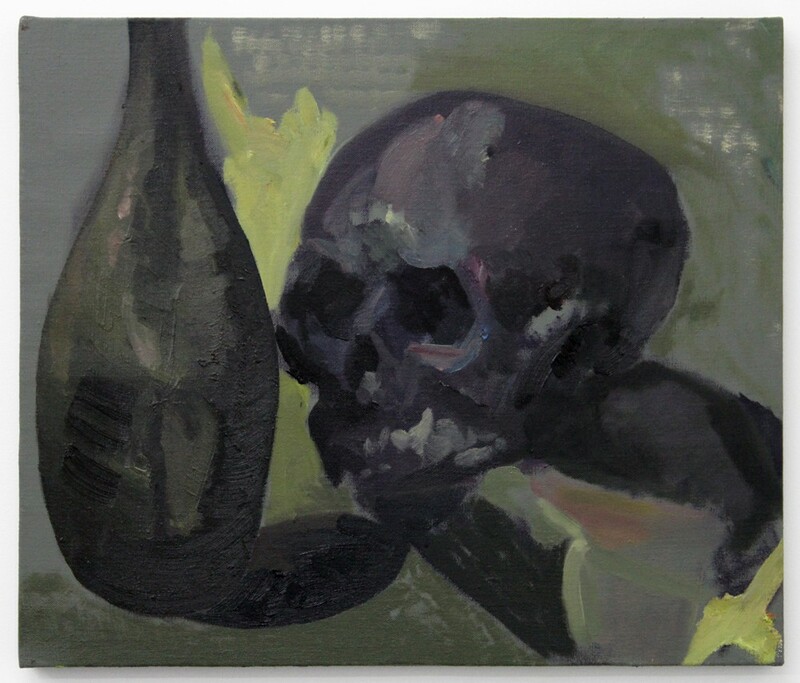 Looking at Faulk’s Dark Skull and Bottle (2016), I imagine a barren landscape littered with like skulls after a dreaded detonation of nuclear weapons, and I wonder, why not paint a skull now? The vanitas theme was made for times like these, and Faulk has put it to thrilling use. The pleasant lala-land of early nineteenth-century style aestheticized still-life scenes are reimagined here by virtue of confounding illogical space-object relations (things often afloat or set apart from ground)—as in Still-Life with Blue Bottle (2016)—and inaccuracies of color perplex and stimulate imagining. In subtle disregard of likeness, Faulk’s deftly chosen hues are a leitmotif: coal- and storm-blue grays, army- and nauseous greens and mummy browns are juxtaposed with fire-oranges, bismol-pinks and ochres that go over well in concert with one another. The paint is impastoed on canvases and wood panels that Faulk made by hand. 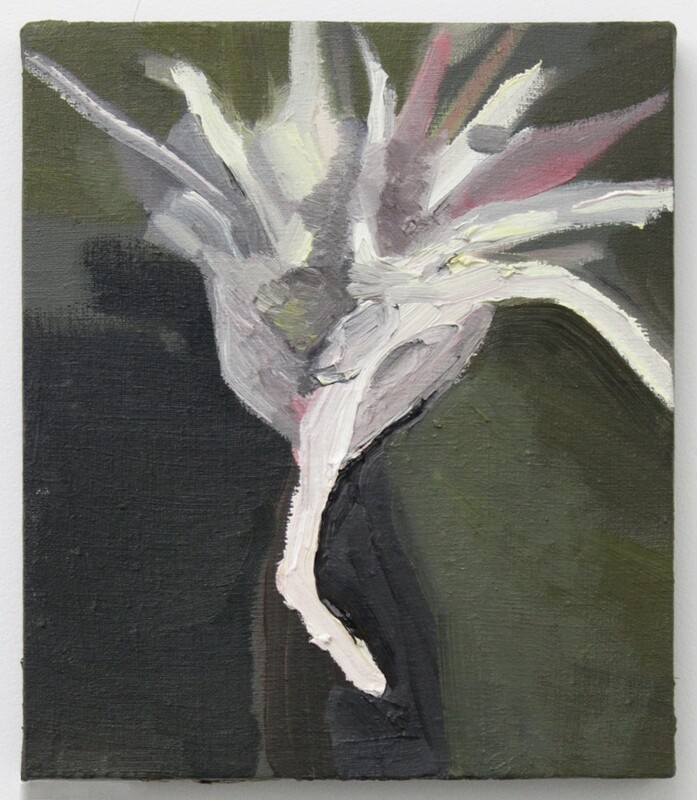 In Spiky Still Life (2016), a white paint commingling with pink and grey-green appears to somewhat animally crawl up off of the panel and out of the frame, making some kind of plant-life look like sci-fi via Cézanne. Throughout the show, Faulk’s paintings are true to his twists on a throwback style, and he has avoided what’s fashionable or reactionary. Rather, Faulk’s responsive compositional choices give rise to questions that reveal depth to an otherwise simple group of paintings. Do paintings “matter” today? What is “natural” or even, what is “life”? In 1960, Fairfield Porter wrote that “since non-objectivity suggests anarchy, it makes a social comment after all,” which is like that saying that goes something like ‘all art is a revolutionary act.’ As we’ve seen, such platitudes can be an impediment to action, but to me, this statement befits what’s worthwhile about Faulk’s chosen medium, style, and all the paintings that make up this show.